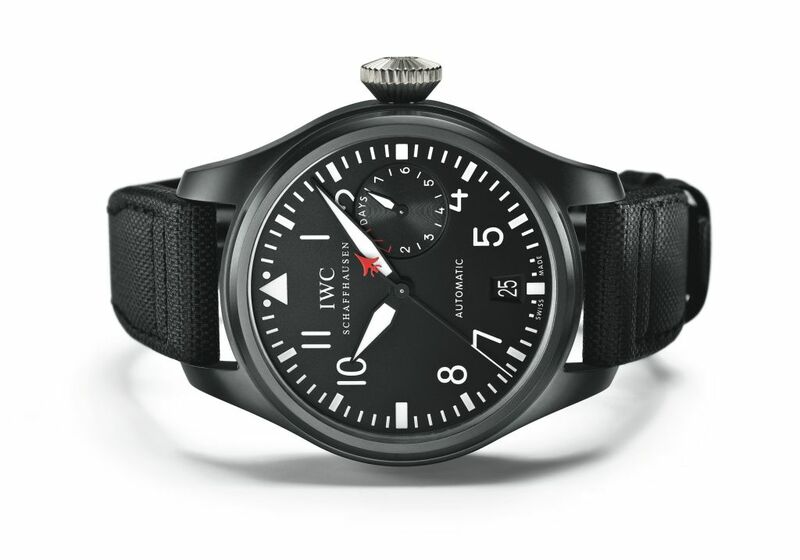 The New IWC Big Pilot’s Watch TOP GUN in ceramic case (Ref. 501901) combines the clear-cut instrument look of the 1940s with ultra-modern watch technology from the 21st century. Fully wound, the IWC-manufactured 51111-calibre movement consisting of 311 components will keep the movement running for 7 days. The Big Pilot’s Watch TOP GUN (Ref. 501901) offers a more contemporary take on functionality with new materials and design elements. The clearly arranged dial with the striking black-and-white contrast and power reserve & date displays remain same. The most conspicuous addition to the popular cockpit look of the design is the small, signal red aircraft silhouette that serves as a counterpoise on the seconds hand and has established itself as one of the distinctive features of the TOP GUN line. Also typical of the TOP GUN are the high-tech materials: first, zirconium oxide, the tough, hard-wearing and scratch-resistant ceramic used for the case, which is water-resistant to 6 bar. Then there’s the extremely rugged titanium used for the crown. And finally the black soft strap used to secure the 48-millimetre case securely and comfortably to the wearer’s wrist. The 51111 calibre is one of the largest automatic movements manufactured by IWC and, with its patented pawl-winding system, builds up a 7-day power reserve in virtually no time. But the power reserve mechanism is smart and allows it to run for only 168 hours before stopping the movement. This way, it is certain that the watch will keep perfect time for 7 days when it is fully wound. On the front, the sapphire glass has antireflective coating on both sides and is secured against sudden drops in pressure.Top Gun insignia is featured on the the reverse side of the watch. Features: Mechanical movement, Pellaton automatic winding, date display, power reserve display, Glucydur® beryllium alloy balance, Breguet spring, screw-in crown, glass secured against displacement by drop in air pressure.